Driver late to pick us up. Food on cruise was poor. One waiter very unfriendly. Nice to be on the Seine, lovely sites.Moulin Rouge really does not have a dress code. Many wearing sweat pants and tennis shoes.Show was very good in a very paced in area. The best way to spend your last night in Paris! Our driver, Jorge, was so knowledgeable, entertaining and fearless driving thru Paris traffic to deliver us safely to the river cruise and Moulin Rouge. We felt like royalty - yes the price is royal - but the whole evening was magical. Don't judge just the food - it's dinner - nicely presented while cruising the Seine and overall experience was excellent. The show at Moulin Rouge did not disappoint. Seats and champagne were excellent. There is no way you can arrange all the details of an evening like this on your own and have the confidence that all will be taken care of. Highly recommend and worth the price. This tour was absolutely amazing! Our boat was able to make it out even though the Seine waters were high. Food was good sights were terrific and we were whisked off to the Moulin Rouge and back to our hotel. A fabulous, memorable evening!!!!! Amazing tour! The boat cruise was an interesting way to see Paris by night. My only complaint would be that the food is mediocre and they charge you for water. The show was just excellent. Seas were in the 300 level which we didn’t mind-we had a good view as long as you don’t mind being in the back. We had a fantastic time. Our experience with Viator was wonderful. Benjamin picked us up from our hotel and took us to meet the dinner cruise area. And he then introduced us to Bruno who after the dinner cruise picked us up and took us to Moulin Rouge. He even had it so we didnt have to wait in line since my husband has walking issues. We were picked up after the show and taken back to our hotel. I would do it all again and with Viator! Hi fellow travellers! 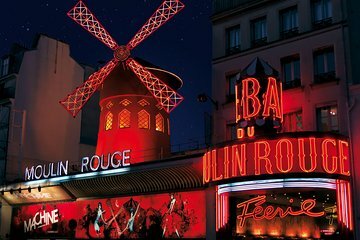 We enjoyed an amazing tour through Viator for the River Seine Dinner Cruise and then we were whisked off to the Moulin Rouge Show with transport provided from our hotel and then dropped off at our Hotel after the Moulin Rouge Show. The experience on the cruise was amazing and the show was outstanding. I would advise anybody going to Paris not to miss this show and the dinner cruise experience. The dinner while cruising was absolute fine dining and you managed to eat, enjoy wine and take in the most amazing sights whilst cruising down the River Seine. The boat was absolutely five star and the pick up service was amazing. The vehicle was a Mercedez Ben Vito going and on the return. The service was 5 star and the drivers absolutely professional. This is the best way of doing both these sights. We even had professional photographs taken and given to us before we left the cruise. 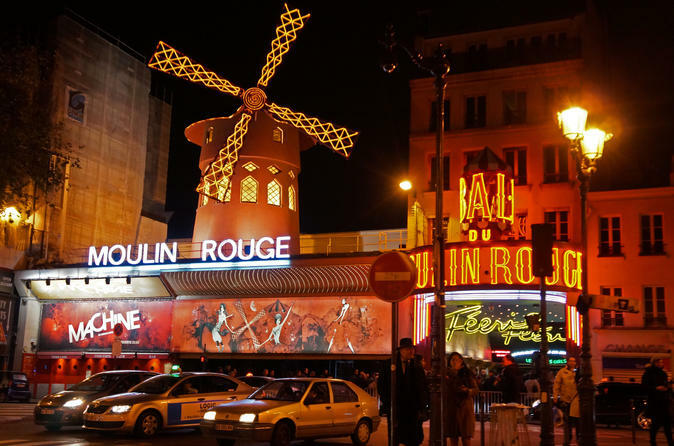 The trip to Moulin Rouge was seamless and we arrived ahead of time to enter the venue. The show was outstanding and must be watched and experienced. The pick up was ahead of time and our driver was there before the show was done. He dropped us off at our Hotel and the entire evening was simply out of this world. We booked this excision and found it to be not what we expected. Dinner was RUSHED, food was not good. We arrived at Moulin Rouge 10 minutes before the show and had the back of the theatre seats. My wife could see nothing and I had to stand, very disappointing and would NOT recommend this excision. Not worth the money spent!!! I loved this tour. We got to see Paris from the water which was beautiful. The meal was lovely on the boat. We were picked up and dropped at the boat and then dropped at the Moulin Rouge for the show, which was great. Then we were picked up and dropped back at our hotels. Seine river good, food is good, moulin rouge was great. personal driver to pickup and bring to our hotel was excellent as he took us touring in the areas near by cafes where Voltaire hung out. Beautiful cafes, very narrow streets and interesting dialogue. We enjoyed this group of tours.